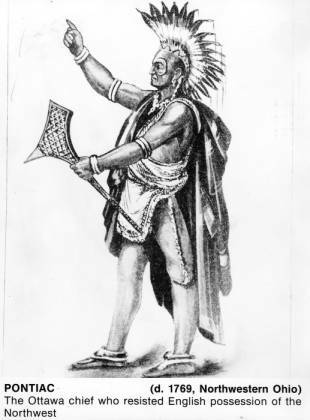 Reproduction of an illustration depicting Pontiac, an Ottawa chief. Pontiac was born circa 1720. His father was Ottawa, and his mother was Chippewa. His family raised Pontiac as an Ottawa, although he had numerous friends among his mother's people. Little is known of his early years. He probably traded with the French merchants that moved into modern-day Michigan and Ohio in the late 1600s and 1700s. By 1755, he had become an important leader of the Ottawas. Pontiac subscribed to the religious beliefs of Neolin, a prophet among the Lenape during the 1760s. Neolin encouraged his fellow American Indians in the Ohio Country and parts west to forsake all British goods and customs. He felt that American Indians' dependence on these items had infuriated their gods. The reason why the American Indians in the Ohio Country currently suffered at the hands of the British was because they had forgotten the true ways of their people. European ways would condemn the American Indians' to eternal suffering. Neolin encouraged American Indians to separate themselves from European ways and not become dependent on them. Although Neolin urged American Indians in the region to reject all European customs, missionaries from the Moravian Church also influenced his views of what he called the Great Spirit. Pontiac was deeply influenced by Neolin's revivalism, but also felt the American Indians had to remain militarily strong to drive the Europeans out of the Ohio Country. This became especially important with conclusion of the French and Indian War in 1763. The Treaty of Paris (1763) turned all French lands in North America over to the English. American Indians feared the loss of their traditional ally and also believed that British settlers would flood the Ohio Country. To prevent the incursion of whites, Pontiac and the Ottawa encouraged Ohio Country American Indians to unite and rise up in 1763. The Ottawa attacked Fort Detroit in May 1763. Many people today view this as the beginning of Pontiac's Rebellion. The Shawnee, the Munsee, the Wyandot, the Seneca-Cayuga, and the Lenape also raided British settlements in the Ohio Country and in western Pennsylvania during 1763. In the autumn of 1764, the British military took the offensive against the American Indians. Colonel John Bradstreet and Colonel Henry Bouquet each launched invasions of the Ohio Country from Pennsylvania. Pontiac's Rebellion essentially ended in the autumn of 1764, but Pontiac did not formally surrender to the British until July 1766. The British promised him no harm as long as he agreed never to wage war against the British again. Pontiac spent the remainder of his life with his family on the banks of the Maumee River. In 1769, Pontiac was murdered by an American Indian. It is not clear why he was killed. The british may have paid a man to kill Pontiac to deprive the Ottawa of one of their leaders. On the other hand, it may have been the work of a group of American Indians who were upset with Pontiac's refusal to wage war against the British. Pontiac's death, like most of his life, remains a mystery. His dream of a united American Indian front against the Anglo-American encroachment on American Indian lands in the Ohio Country did not end with him. Other native leaders, such as Tecumseh and Little Turtle, would also try to form American Indian confederations to stop the westward expansion of white settlers in the late 1700s and early 1800s.